While EUR declined after the poor preliminary consumer confidence index, US existing home sales also came less than expected. The support rests at 1.16390 with resistance at 1.17130 which the weekly pivot point at 1.16810 is located in between the lines. The EMA of 10 is moving with bearish bias in the descendant channel and it is above the EMA of 200 and the EMA of 100. The RSI is moving below the 50 level, the Stochastic is moving in low ranges and the MACD line is on the signal line in the neutral territory. The ADX is showing sell signals. 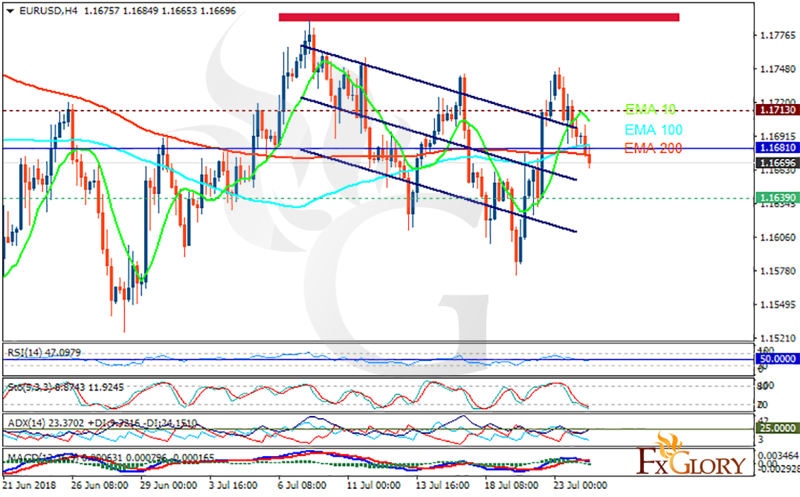 While 1.17 area remains a strong resistance zone, EURUSD will probably continue its bearish trend towards 1.16.